Outdoor IP cameras face many challenges. Of course, there’s the weather. As anyone who’s tried to use a camera at the beach knows, sand can just destroy a camera. Fog and smoke can ruin your picture. There’s also the potential for vandalism. There is also a vast array of scenarios that require outdoor surveillance cameras. The needs of a highway, a stadium, a construction site, and an ATM are all very different. 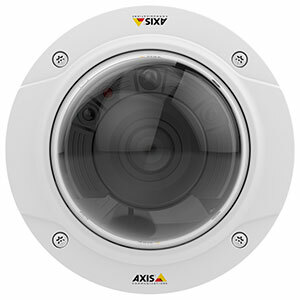 Axis Communications is the premier network security camera in the world. They’ve been doing it longer than anyone else and they’re still at the front. Their surveillance cameras are trusted around the world to provide professional security. Their longevity and envelope-pushing mean that Axis cameras cover virtually every scenario possible, including numerous outdoors scenarios. 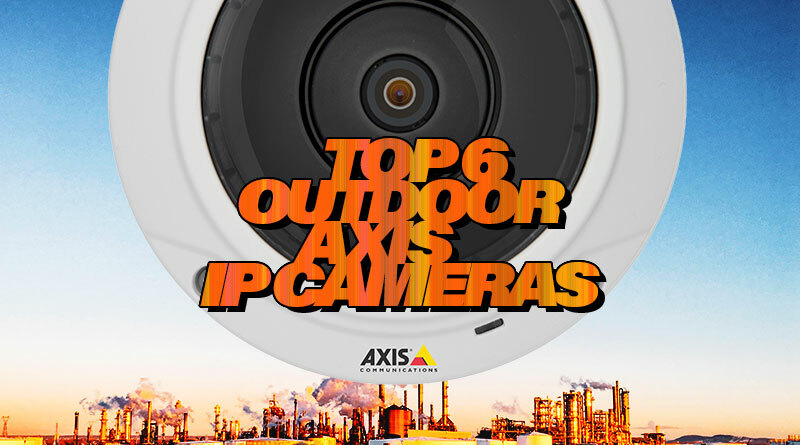 In this blog, we offer our choices for the top six outdoor-ready Axis IP cameras. 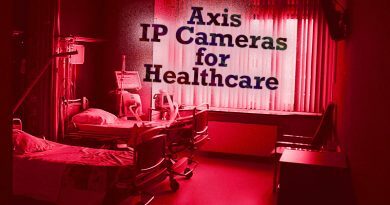 Because Axis work so hard to cover every scenario, their portfolio of IP camera options is very large. It can be intimidating or confusing to try to find the camera you need. If you need professional surveillance in open spaces like hotels, gas stations, restaurants, schools or offices, check out Axis M3027-PVE. 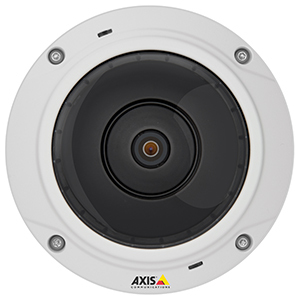 Axis M3027-PVE is a mini-dome camera that provides highly detailed 360° or 180° panoramic video. When we say mini-dome, we mean that M3027-PVE measures less than 5.5” inches in diameter. It’s highly discreet. Yet packed into that tiny frame is a 5MP sensor and 1.27mm lens with f/2.0 aperture. The lens has a field of view of 187° ´ 168°, giving you a panoramic picture. The camera has a ±180° rotation range, so you’ll be able to place it in a convenient location without worrying about whether you’ll get your shot. M3027-PVE has several modes for viewing and recording your surveillance video. You can set it to 360° overview, dewarped panorama, double panorama, or quad view. You can have the view areas individually cropped and dewarped for easier viewing. There’s more. 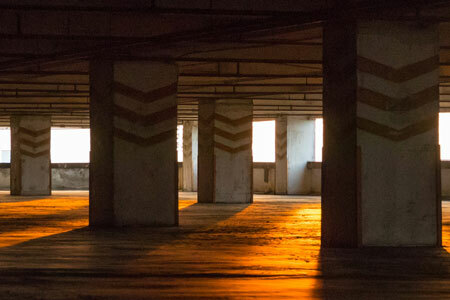 M3027-PVE features WDR – Dynamic Contrast technology to adapts to challenging lighting situations to greatly reduce the amount of detail lost to over- or under-exposure. M3027-PVE is also weather- and vandal-resistant. Its aluminum casing and polycarbonate cover with dehumidifying membrane are IP66 and IK10 rated. The electronics are encapsulated for further protection against the elements. It uses Torx security screws to prevent tampering. When you need an outdoor-ready camera for protecting entrances to banks, hotel, restaurants, and the like, look to Axis M3105-LVE. This discreet surveillance solution measures less than four inches in diameter and is repaintable, so it’ll seamlessly blend in with the surroundings. 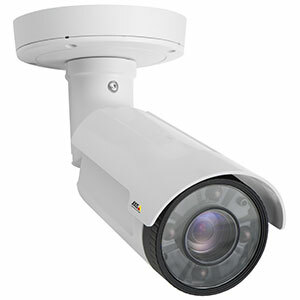 It takes highly detailed security video at 1080p Full HD resolution. This turret-style mini-dome IP camera features a flat-faced design that reduces the reflections that can harm your video evidence. The 2.8mm lens with f/2.0 aperture has a wide-angle field of view of 115° ´ 64°, more than enough to cover an entrance. It can pan 180° in either direction and has a tilting range of 60° and rotating range of ±95°. WDR – Forensic Capture technology provides an incredible 115dB of dynamic range, retaining detail even in the high-contrast lighting situations typical of doorways. If your doorway happens to be narrow, use Corridor Format, which aligns the video vertically so you’re not wasting bandwidth on surveilling walls. M3105-LVE is designed to last, even in harsh conditions. Its polymer casing is IP66 and IK08 rated. It has an active tampering alarm and uses Torx security screws to prevent vandalism. 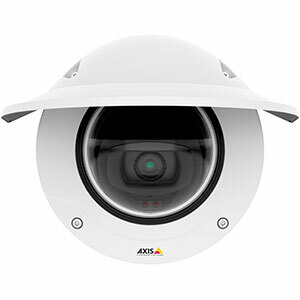 For a general use IP camera that delivers 1080p Full HD detail, try Axis P3225-LVE Mk II. This vandal-resistant dome camera fits almost any situation where detail in any lighting condition in needed: banks, offices, courts, carparks, and the like. P3225-LVE Mk II has a varifocal 3.0-10.5mm lens with a very wide f/1.4 aperture. This means you get lossless zoom and excellent low-light performance: it takes full color video down to 0.16 lux. Axis Lightfinder ensures that your nighttime video retains lifelike color. 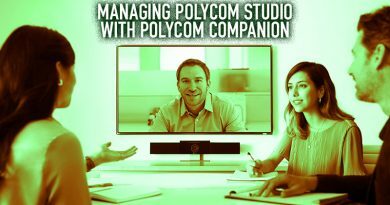 You can control zoom and focus remotely. For absolute darkness, P3225-LVE Mk II has built-in infrared illuminators with a range of 100ft. Axis OptimizedIR means you get power-efficient LEDs with minimal heat dissipation, so your illuminators will be long-lasting and limit power usage. You can power the camera’s LEDs using PoE. P3225-LVE Mk II features Axis WDR – Forensic Capture technology. This means that you get 120dB of dynamic range, an incredible solution for high-contrast lighting such as you would find under awnings or near ATMs. The ATM might be in the shade but the sidewalk in sunlight. Rather than setting your picture to one lighting level and having the other be under- or over-exposed, WDR – Forensic Capture intelligently adapts to both, so you get the detail you need. The casing is IP66 rated against the elements and IK10 rated against impacts. The hard-coated dome has a dehumidifying membrane. P3225-LVE Mk II is operational down to -40°F, so you don’t need to worry about the cold. The camera is also vandal-resistant. If you don’t need your camera to take video in complete darkness, try Axis P3225-VE Mk II. This camera is identical to the P3225-LVE Mk II, except that it lacks the infrared illuminators. If you need a surveillance camera that works as well for overviews as it does for intensely detailed images, look to Axis Q1765-LE. This affordable bullet camera includes professional optics and advanced technology into a slim yet rugged frame. It takes video at 1080p Full HD resolution. Q1765-LE features 18x optical zoom using a 4.7-84.6mm lens. The wide f/1.6-2.8 aperture provides excellent low light performance even when zoomed in. On top of the optical zooming, you get 12x digital zoom. It saves you time and effort by having autofocus and automatic day/night detection. 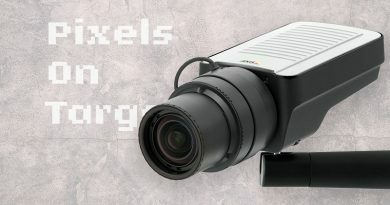 The camera features built-in infrared illuminators with Axis OptimizedIR. When fully zoomed in, the power-efficient infrared LEDs have a reach of 130ft. When fully zoomed out, the range is 50ft. OptimizedIR makes sure the illuminators perform correctly for the situation. Q1765-LE supports two-way audio and has two configurable alarm I/O interfaces for maximizing your security in places like gas stations. 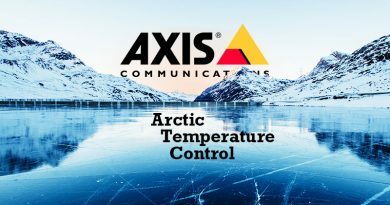 Axis Q1765-LE features Arctic Temperature Control, which protects the camera in case of power going down in extreme cold. While power failure might permanently damage another camera, Arctic Temperature Control allows Axis Q1765-LE to heat up slowly, getting it back online without harming the internals. It also supports Corridor Format, which turns the picture frame vertically, so it looks more like video shot on a smartphone. Why would you want that? If your camera is trained on a hallway or similarly narrow space, a typical camera would waste a lot of bandwidth and storage recording the walls. Flipping the picture frame vertically solves this problem. The camera is IP66 rated with an impact-resistant aluminum casing and dehumidifying membrane. 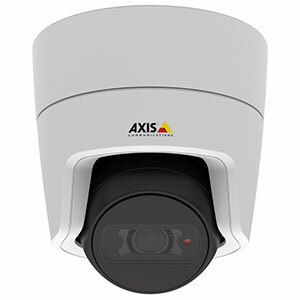 When you need highly detailed, extremely reliable surveillance in harsh conditions, Axis Q3515-LVE is your go-to choice. Perfect for airports, carparks, stadiums, arenas, and similar environments, Q3515-LVE takes 1080p Full HD video using a top-quality sensor. Axis Q3515-LVE comes in two models with different lenses: Axis Q3515-LVE 9mm and Axis Q3515-LVE 22mm. For a broad overview with an ultra-wide-angle lens, go with the 9mm model. For a closer view with a wide-angle lens, go with the 22mm model. It can take video at up to 120fps (frames per second), giving you fine-grained detail in scenes with fast-moving objects, like highways or city streets. Q3515-LVE has a 360° panning, ±80° tilting, and ±175° rotation range. The 9mm model offers 3x optical zoom and the 22mm offers 2.4x optical zoom. WDR – Forensic Capture technology lets the camera adapt to lighting so you get an amazing 120dB of dynamic range. Axis Lightfinder improves low-light performance, giving your video lifelike coloration even in extremely dark situations. If you need video in pitch-black conditions, you can use the integrated infrared illuminators. Axis OptimizedIR lets the IR LEDs work in tandem with the lens to optimize lighting. The 9mm model has a range of 130ft and the 22mm has a range of 200ft. The camera is designed to give you peace of mind in extreme conditions. It has an operating temperature range of -58°F to 140°F. The aluminum casing and polycarbonate hard-coated dome is IP6K9K and IK10+ rated for class-leading durability. Q3515-LVE is vandal-resistant. 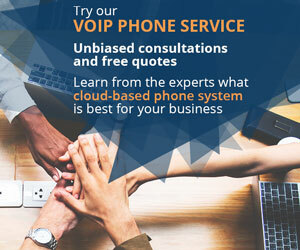 To find the best selection of Axis IP cameras, visit IP Phone Warehouse!